Three times each month, dozens of women gather in dusty courtyards in rural towns in Manikganj, Dinazpur or other districts across Bangladesh to learn all they can about the only means by which they can support their families: migrating to another country for work. 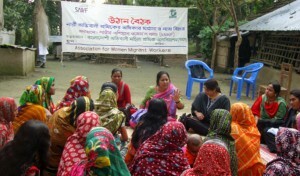 In leading these information sessions, the Bangladesh Migrant Women’s Organization (BOMSA) seeks to assist women in understanding their rights—from what they should demand of those who facilitate their migration, to the wage and working conditions at the homes in Gulf and Asian countries where they will be employed as domestic workers. “What I want for these women is that they are safe, they get their wages,” says Sheikh Rumana, BOMSA general secretary. Rumana founded the organization in 1998 with other women who worked with her for years in Malaysian garment factories. Before she migrated for work in Malaysia, Rumana was promised a good salary at an electronics plant. But when she arrived, she was put to work at a plant making jackets and paid pennies for each piece she sewed. The gap between the promise and reality of migrating for work overseas is the focus of migrant worker activists across Asia. This month, Rumana and seven other migrant worker activists from Bangladesh, India and the Maldives are traveling across the United States as part of a Solidarity Center exchange program supported by the U.S. State Department. The group is meeting with U.S. activists working on labor rights, migrant rights and anti-human trafficking issues in Washington, D.C., New York and Los Angeles to discuss best practices to promote safe migration and share ideas for raising awareness about the risks of migrating for work. Like BOMSA, the Welfare Association for the Rights of Bangladeshi Emigrants Development Foundation (WARBE-DF) assists those seeking to migrate, provides support for workers overseas and assists them upon their return. The organization also has successfully pushed the Bangladeshi government to ratify the United Nations (UN) convention on the protection of migrant workers and is campaigning for passage of the International Labor Organization convention covering decent work for domestic workers, says Jasiya Khatoon, WARBE-DF program coordinator and AFL-CIO Solidarity Center exchange participant. “Lack of job opportunities” is what drives millions of Bangladeshis out of their country in search of work, Khatoon says. Some 8.5 million Bangladeshis are working in more than 150 countries, according to 2013 government statistics. Many workers migrating from Bangladesh and elsewhere are first trafficked through another country—where a lack of proper documentation may result in their arrest. In Mumbai, India, a transit point for many migrants, human rights lawyer Gayatri Jitendra Singh works both to assist imprisoned migrant workers and to change the country’s laws so that, rather than penalizing migrant workers, the laws recognize the culpability of traffickers and corrupt labor brokers. Singh, a former union organizer, and other migrant advocates, point to the actions of labor brokers as the biggest underlying problem in the migration process. Many labor brokers charge such exorbitant fees for securing work that migrant workers cannot repay them even after years on the job, essentially rendering them indentured workers. They remain trapped, often forced to remain in dangerous working conditions because their debt is too great. Unscrupulous brokers also lie about the wages and working conditions workers should expect in a destination country, the migrant advocates say. Singh and the other migrant advocates came to the United States filled with fresh stories about the suffering of migrant workers and their families: a Bangladeshi domestic worker in Jordan and another in Lebanon who had just returned to Bangladesh, still suffering the effects of nightly sexual abuse by their employers; the family of an Indian construction worker who died in Qatar and is unable to pay for the return of his body; the 12-year-old Bangladeshi girl whose passport cites her age as 25 so she can migrate overseas to support her family because her father is ill.
Join us in the campaign! Copyright © 2014-2019. www.cmw25.org. All rights reserved.